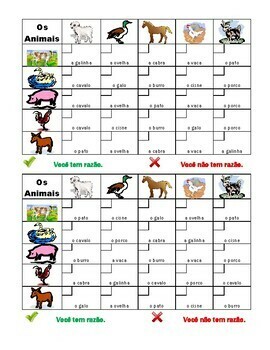 The purpose of this activity is to use the vocabulary words pictured. This is a partner activity, each getting one-half of the page. Student A designates a box by calling its coordinates (o pato e o porco). Student A then guesses which of the ten words are in that box. 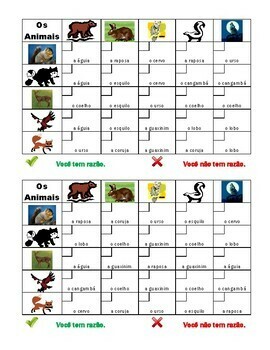 Student B responds either Você tem razão or Você não tem razão and records the appropriate answer on his sheet. 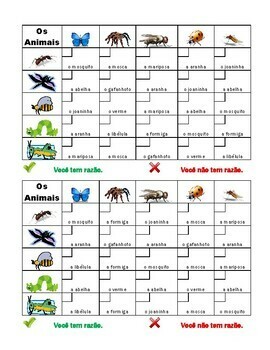 Students alternate turns until all of both sheets have been completed. At the end of the round, students add the number of checks to see who wins. 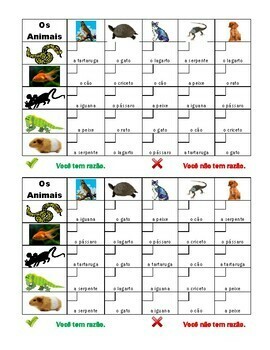 This includes 6 games: pets, farm animals, forest animals, bugs, zoo animals, miscellaneous animals.